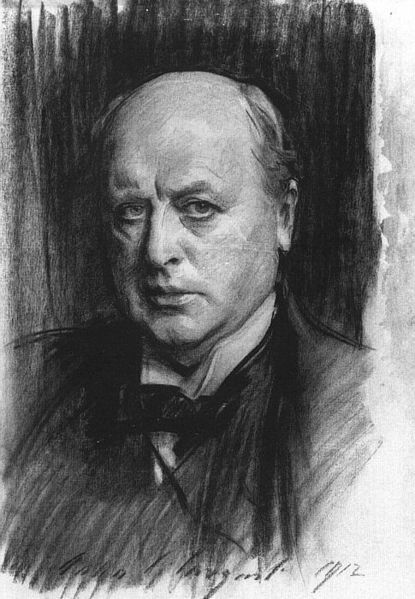 Hope, Courage, and Feminism in The Portrait of a Lady – The Bookshelf of Emily J.
I’m not a big fan of Henry James (1843-1916), pictured below. I’ve dutifully read him for class assignments, but never for pleasure until last fall. My favorite professor, whom I still see often because we teach at the same university, recommended that I read James’s The Portrait of a Lady (1881). He was reading it with one of his classes, and by his logic I’m a woman, so I should enjoy reading something titled The Portrait of a Lady. I did enjoy it. Isabel Archer’s adventures overseas are not fast-paced or exciting, but they are filled with difficult and thought-provoking moments involving love and marriage. What woman cannot relate to that? Isabel is an American girl visiting her relations in England. Lord Warburton, a friend of the family and rich older gentleman whom Isabel does not love but who would make her life secure and comfortable, proposes to her. She refuses. Instead, Isabel travels to Italy and ends up marrying Gilbert Osmond, who has a daughter from a previous marriage, said to have ended with the death of his poor wife. (This is not true, as we later find out). This marriage is one that everybody opposes, yet Isabel makes it anyway. Instead of returning home with the dashing and wealthy American Caspar Goodwood, whom I saw as a reasonable companion for Isabel, she stays abroad in Italy with Osmond. Years later she is unhappy. She foolishly marries with her heart instead of her head and pays for it. However, the novel leaves us with hope. She is does not divorce Osmond, but she does leave against his wishes to attend to some family business. She returns to him even after Mr. Goodwood has again sought her out and promised to save her from the wicked husband. She does no such thing. She returns home to face the consequences of her actions, yet as the narrative leaves off, we are left with the hope that she will work things out and eventually find happiness in love. Whether or not that is with Mr. Goodwood is unclear, but we do know that she must return home to help her step-daughter Pansy, who is trying to marry the man she loves against her father’s wishes. Isabel’s actions are noble. She is a true lady in this regard, for she puts aside her own feelings of unhappiness and entrapment to protect and defend her beautiful, innocent, and helpless step-daughter. After I finished the 608-page novel, I of course returned to my favorite professor to discuss its details. By his lights, the novel is truly about courage. Isabel does not shrink from her responsibility in the end, although she wishes to. Instead she displays courage and faces what will come. She is brave and strong for doing so. The easy way out would have been to run away with Mr. Goodwood, avoid a divorce, and leave poor Pansy (a fitting name) to fend for herself. But Isabel does not. She faces the consequences of her actions instead of fleeing. The best part of this novel, besides the lesson in courage, is the character names. Isabel’s cousin is named Ralph Touchett. I’ve already mentioned Mr. Goodwood, whose name needs no explanation. And Isabel’s best friend, an annoying and persistent American reporter, is named Henrietta Stackpole. Mary-Louise Parker is brilliant as Henrietta in the 1996 film. She does the right amount of annoying, eager, and brassy American against Nicole Kidman’s soft spoken, beautiful, and innocent Isabel. Despite the serious subject matter and heavy prose, Mr. James has fun with his characters’ names. This weekend, I watched the movie version. I find that my reaction to the novel has changed somewhat. I am now entertaining the idea that perhaps James found women to be incapable of making good decisions when allowed to have freedom to do so. The entire premise of the novel is based on the idea that Isabel does not want to marry but instead wants to be independent and travel. This is all made possible upon the death of her uncle, who leaves her a fortune at her cousin Ralph’s urging. Yet, what happens is that Isabel refuses three perfectly good suitors and falls for the one with malicious intentions. She has independence and freedom and botches it all by marrying Osmond and making herself miserable. Osmond doesn’t love her, but instead loves her money. Osmond isn’t honorable, but instead has secrets in his past, secrets which have not even been completely put away. Given Madame Merle’s proximity to the plot and the daughter they share, I’d say there’s still hanky-panky going on under Isabel’s nose. So, despite her financial ability to choose and be free, Isabel makes the most wrongheaded choice and suffers deeply for it. What does this say about women? What does this say about James’s opinion of women? Perhaps this view is faulty and James redeems himself through the resolution that my professor focused on instead. Perhaps James’s portrayal of women is a testament to a woman’s strength in times of deep stress and upset. Perhaps the “portrait” he has painted tells us that Isabel is a strong woman and that her desire to be independent will ultimately get her through the end of an unhappy and seemingly abusive marriage, but that she will do the right thing first by Pansy. Perhaps women are better equipped than men to handle such difficulty when children are in the middle. I’m not sure where I stand, but I know from my feminist perspective, I find it difficult to swallow the fact that of four suitors, Isabel somehow picks the most deadly for her soul. If you want to see the film, I recommend it. It stays pretty true to the novel, but does take some creative license in interpreting scenes and adding scenes that I’m not sure were part of the novel. The film is dark, which seems to be an artistic attempt to portray a mood, but I didn’t see this darkness as an accurate feature of the novel. The ending of the film is also more subtle than the novel and leaves more for the viewer to decide. I still liked it, however. Getting a copy of the film proved difficult. Apparently, it has not been released on DVD yet because the distributing company went under. I waited patiently for a copy of it for over a year from Netflix, to no avail. I checked Amazon to buy it, but did not want to spend over $40. I asked friends, and nobody had it. I finally went to my local video store where I found it on VHS, and the owner explained to me the intricacies of film distributing companies and their collections having gone through many owners over the years. Consequently, many of the movies from the 1980s and 90s have not been transferred to DVD and may never see that fate. I watched the VHS version on my trusty VCR, which I purchased at the local thrift store for $4 several years ago. I haven’t had any trouble with it. It’s a sturdy Sony from a far distant time when electronics were made with care and lasting power. Do I recommend The Portrait of a Lady? Why, yes. Yes, I do. Mr. James may have something to offer after all. Pingback: Ideal Women of Literature: Attainable Beauty « The Bookshelf of Emily J.